A tile engine for LameGFX. It provides functions to display and interact with tile-based game maps. Demos for this object can be found in the /demos/maps/ folder of the SDK. map.Draw - Draw the current map to the screen. map.DrawRectangle - Draw the current map to a portion of the screen. map.Height - Return the height of the current map in tiles. map.Load - Load a map into LameMap. map.TestCollision - Test if the region has collided with a map tile. map.TestMoveX - Apply horizontal movement to an object's position and test if it will collide. map.TestMoveY - Apply vertical movement to an object's position and test if it will collide. map.TestPoint - Test whether a tile in the map is collidable. map.Width - Return the width of the current map in tiles. Game maps consist of three parts: a tile map, a level map, and an optional collision map. A tile map is a 2D array of sprites intended for creating maps, organized so that they can be indexed by a level map. On LameStation, the tile map format is just an ordinary sprite with frames. A collision map mirrors the tile map and determines which tiles can be walked on and which ones can’t. On LameStation, a collision map is an image of black and white squares, the same size as the tile map. A black square cannot be walked on, and a white one can. A level map combines the data in the tile map and collision map to build a space that can be navigated as part of the gameplay. The level map format is described in the next section. Map data is raw data describing what an area looks like and how the player can interact with it. width, height (0-65535) - The width and height of the image in tiles. tile - The array of tiles that make up this level, placed left-to-right, top-to-bottom. Each tile in a map is one byte, with 1 bit used for collision, and the other 7 used for the tile number. Collision data is stored in the level to save space and so collision can be customized for the map. 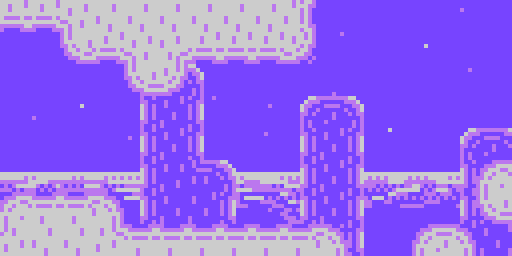 Tile 0 is used as a null tile, so the maximum usable tilemap size is 127 tiles. The collision bit stores whether a tile will register a collision when touched. All collision functions return 0 unless this bit is set. The address of the map data can be passed directly to map.Load, unless stored in another object. If so, the following function is used as an interface.